Does a lost person have to pray a sinner's prayer to be saved? A person does NOT have to pray a sinner's prayer to be saved; but, they do need to believe upon the Lord Jesus Christ. However, most people do pray some type of prayer when they believe upon Christ. 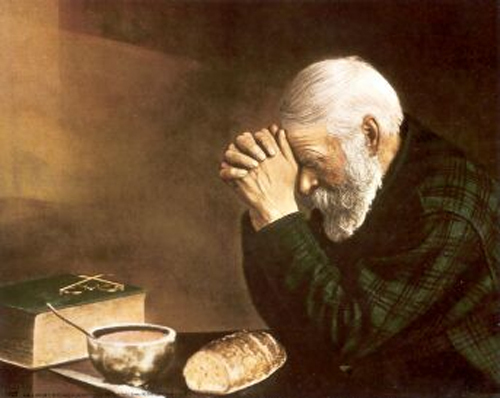 The publican in Luke 18:13 prayed, "God be merciful to me a sinner." The thief on the cross said to Jesus, "Remember me today when Thou enterest into Thine Kingdom." It was the man's belief that prompted him to pray, asking for salvation. Of course, the man didn't need to say anything to Jesus, he could have simply believed in his heart. Many of the chief rulers of Israel believed upon Christ; but never made it public for fear ... "Nevertheless among the chief rulers also many believed on him; but because of the Pharisees they did not confess him, lest they should be put out of the synagogue" (John 12:42). As you can see, fear of audibly confessing Christ does NOT prevent a person from getting saved. Salvation is of the HEART, NOT the mouth. So whether a person prays a sinner's pray or not is irrelevant to their salvation, what matters is what is going on in the heart. The sinner's prayer is actually after the fact. A person prays because they have already believed in their heart. When a person leaves their pew in church, and walks down the isle in response to a salvation invitation, they are already saved. Isaiah 65:24 declares, "And it shall come to pass, that before they call, I will answer; and while they are yet speaking, I will hear." People walk down to the front of the church, to the alter, to find out what they did. At the alter, a soulwinner shows them from the Bible how to be saved. It was the lost sinner's faith that caused him or her to step out of their pew and go forward. It was David's faith that prompted him to fight Goliath. Had David lost the battle, his faith would have been no less great. It wasn't David slewing Goliath that made his faith great, it was David's great faith that caused him to go out to fight Goliath in the first place. Noah's great faith prompted him to set out to build the ark, and carried him through 'til the end. Likewise, it is one's faith in Jesus Christ that prompts him to pray a sinner's prayer. The sinner's prayer is a natural response from a human heart that needs to cry out to God for forgiveness. Notice that 1st John 1:9 states that if we "confess" our sins to God, God will forgive us. It doesn't say, if we "ask for forgiveness." Hence, God forgives us before we even get to the point of asking for forgiveness. God beats us to the punch! While we're confessing, God has already forgiven us. That's how much God wants to forgive us and make things right. Of course, 1st John 1:9 was written to believers, but the same merciful and loving God is willing to forgive all who come to Him through Christ Jesus ... "Come now, and let us reason together, saith the LORD: though your sins be as scarlet, they shall be as white as snow; though they be red like crimson, they shall be as wool." It's up to you. Through the blood of Jesus Christ, all your sins can be taken away forever. So a person doesn't need to pray a sinner's prayer to be saved, but it is certainly appropriate and welcome. Incidentally, I don't like the public invitation. I think public invitations often add a step to salvation which God does NOT require. No doubt, many people have not been saved because they were afraid to walk down an isle. God can save a lost sinner right in their pew, without them stepping forward. All God asks is that we believe upon His Son, Jesus Christ, as our personal Savior. Jesus Christ came to this world as God Almighty in the flesh. The Godhead became incarnate (Colossians 2:9; 1st Timothy 3:16). Jesus Christ is the manifestation of the Godhead to mankind. God asks us to believe upon Christ, and receive Him as the Son of God, as our personal Savior. Christ went to the cross of Calvary's hill and died in our place, paying a debt of sin that He did not owe. He was buried and then resurrected after three days for our justification. This is the Gospel (good news) that Christ died on the cross in our place, was buried and is risen! The sinful world rejects Christ, mocking Him, and continually questioning His legitimacy. We've seen a plethora of books and movies, such as The Da Vinci Code, The Jesus Papers, and The Gospel of Judas—all mocking, attacking, and blaspheming the deity of our precious Lord Jesus Christ. It is certainly appropriate to lead people to ask Jesus to forgive them of their sins, but we would be wise to also inform them that prayer does not save a person. It is the faith in one's heart that brings salvation. Romans 10:13 declares, "For whosoever shall call upon the name of the Lord shall be saved." The word "call" in the Greek means "to rely upon, to trust." It does NOT necessarily mean to audibly call upon the Lord, although a person may audibly call upon the Lord Jesus as part of their heart's belief. Salvation is of the heart, as we read in Romans 10:10 ... "For with the heart man believeth unto righteousness; and with the mouth confession is made unto salvation." It is clear from Matthew 7:21 that praying in and of itself is insufficient to bring salvation, "Not every one that saith unto me, Lord, Lord, shall enter into the kingdom of heaven; but he that doeth the will of my Father which is in heaven." So what is the will of the Father? Glad you asked, John 6:40 proclaims ... "And this is the will of him that sent me, that every one which seeth the Son, and believeth on him, may have everlasting life: and I will raise him up at the last day." The will of God is to believe upon Jesus Christ. John 3:16 states, in no uncertain terms, "For God so loved the world, that he gave his only begotten Son, that whosoever believeth in him should not perish, but have everlasting life." I don't see anything about baptism in there, or speaking in tongues, or making a commitment to Christ, or the seven-sacraments, or good works, or church membership, or turning over a new leaf, or becoming religious--all that God requires of a person to be saved is to BELIEVE UPON THE LORD JESUS CHRIST. Acts 16:30,31 states... "Sirs, what must I do to be saved? And they said, Believe on the Lord Jesus Christ, and thou shalt be saved..."
Titus 3:5 states, "Not by works of righteousness which we have done, but according to his mercy he saved us..." Good works is a road to Hell. Jesus paid our sin debt because we cannot. The Sabbath was a picture of Jesus, who is our Sabbath today. Man ceased from his own six days of work, and rested upon the seventh day (a picture of Jesus). Hence, we cease from our own human efforts and trust solely upon the Lord for salvation. This is what Hebrews 6:1 means what is speaks of repentance from DEAD WORKS. In fact, you don't even have to ask Jesus to save you to be saved. Nowhere in the Bible are we told to “ask” Jesus to save us. It's not wrong to ask, but the Lord has already told us how to be saved, and that is, “believe on the Lord Jesus Christ and though shalt be saved” (Acts 16:30-31). That's how you get saved, you come to Jesus and trust Him. If you trust in some church denomination to be saved, you'll go to Hell. If you trust the water baptistry to help you get to Heaven, just in case, you'll go to Hell forever. It's not wrong to pray a sinner's prayer or to ask the Lord to save you; but Biblically, all you need to do to be saved is to believe (rely upon for your salvation) that Christ died on the cross for your sins and rose from the dead (1st Thessalonians 4:14). Notice that James 2:19 condemns a passive belief that only acknowledges Jesus' existence; but doesn't actually trust upon Him, "Thou believest that there is one God; thou doest well: the devils also believe, and tremble." Saving belief involves a DYNAMIC faith, a faith that trusts 100% upon Jesus Christ ALONE for salvation. Many people claim to believe in Jesus; but they've never actually made the decision to solely rest upon Christ's finished work of redemption. Some foolish people today have twisted the Bible to claim that good works are necessary for salvation; BUT, they are not. The only good work required for salvation is to believe upon Jesus Christ. You've probably noticed that I use the word "upon" often when speaking of salvation. I don't like to say "believe in" Jesus, because of what James 2:19 teaches. Many people believe "in" Jesus; but, they DON'T believe "upon" Jesus. Do you believe upon Jesus? Have you placed all your trust for eternal life upon the finished work of Christ, upon His blood sacrifice for your sins? Jesus shed His blood for our sins, and applied that blood to the Mercy Seat in Heaven before the Father, so we could be forgiven and saved from Hell. As an excellent example: I can say that I believe a stepladder will support my weight if I stand upon it. I can say that all day long if I want. However, that is only OPTIMISM, NOT faith. Faith is standing upon the ladder! No amount of optimism that a ladder can hold me up, can replace faith. Let me apply this to salvation. Many people speak highly of Christ (represented by the ladder). They claim to believe that Jesus can save them, and that Jesus is good, and that Jesus is strong; but, they've never actually placed their weight, their complete trust, upon the Savior. I meet people all the time who tell me how wonderful Jesus is; but then tell me that they're trusting upon baptism, church membership, good works, religion, the seven-sacraments, the Virgin Mary, the priest, and all sorts of other religious mumbo-jumbo to save them!!! To trust upon ANYTHING other than Jesus Christ ALONE is the same as holding onto a big rope while standing upon a ladder (just in case the ladder fails). So you're NOT truly trusting the ladder if you have to hang onto a safety rope. This is where MOST people are at today in religion. Most people today who claim to believe in Jesus are also trusting upon all sorts of religious gimmicks, ceremonialism, formalism, and superstition to save them. The Bible is clear that you either trust Jesus Christ ALONE, or you go straight to Hell when you die. There are NO exceptions! Ephesians 2:8-9 state, "For by grace are ye saved through faith; and that not of yourselves: it is the gift of God: Not of works, lest any man should boast." A "gift" cannot be earned; but only received. I spoke with a Catholic man yesterday who said he believes in Jesus; but he is unsaved. He said he used to be a Baptist, but converted over to Roman Catholicism to make his wife happy. He said to me, "All I know is that I believe in Jesus." He is sincere, but lost. He has never rested solely upon the Savior; therefore, he sees nothing wrong with adding works and religion to one's faith in God. It is important for a sinner come to the realization that he MUST personally trust upon the Savior, who shed His blood for their sins. Again, it is NOT enough just to acknowledge the Lord's existence (James 2:19). So if we just tell people to believe in Christ, it might lead some people (like the Catholic above) to think they're already saved. We, as Christians, have a duty to warn the wicked that ADDING anything to the Gospel of Jesus Christ is a sure road to Hell. There's all kinds of TV evangelists who preach a shabby, watered-down Gospel; but, they won't talk about how ADDING WORKS corrupts the Gospel. They are eerily silent. The sinner's prayer is Biblical; but not necessary for salvation. Some people pray, others don't. I think the important thing for us (as believers) is to make sure to present a CLEAR Gospel presentation to lost sinners. We are NOT saved by praying a prayer; but, one who believes upon Christ may certainly pray a prayer in the process. To lead someone in a sinner's prayer is to lead them to believe on Christ, for no unbeliever would sincerely ask Jesus to forgive their sins and take them to Heaven when they die. Some soulwinners may prefer not to use a sinner's prayer. However, in such cases the soulwinner must be diligent to explain to the person that mere belief (acknowledgment) IN a Savior is not the same thing as a saving belief (trust) UPON the Savior. And likewise, the soulwinner who leads a person in a sinner's prayer should be diligent to explain to the person that prayer alone cannot save someone. There MUST be faith in the heart, otherwise you simply have vain religion. I've literally heard people tell me that they became a Christian by praying. No, a person becomes a Christian by trusting upon the Lord Jesus Christ to forgive their sins. The issue is our SINS. They must be dealt with. Jesus died to take away our SINS. Don't trust a prayer, or merely acknowledging the existence of Jesus, to save you. Rather, TRUST upon the precious Savior, Jesus, and the precious blood He shed to take away our sins. You trust Jesus by placing 100% of your faith upon Him, and His shed blood. Trust nothing or no one else, just Jesus!